We have more than 100 years of tradition & excellence using Fresh milk produced from green pastures on 3,200 family owned farms to produce the highest quality dairy food products that we are proud to serve to our valued customers in over 80 countries throughout the world. We are committed to sustainability for our future generations. This starts at the farm and extends along the chain throughout our processing operations and across every aspect of our business. These are our commitments to our customers all round the world. Lakeland Dairies is a market led, innovation focused manufacturer of superior quality, application specific food ingredients. Pritchitts, the foodservice division of Lakeland Dairies, is dedicated to providing our customers with the highest quality service & products. 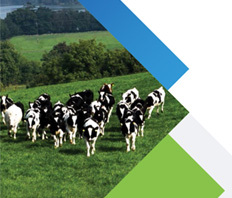 We are a leading and innovative feed manufacturer and supplier of agricultural inputs across the north and south of Ireland. 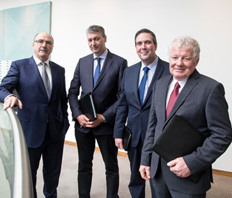 Lakeland Dairies Co-operative Society Limited and LacPatrick Co-operative Society Limited have today created history by formally completing the merger of the two Societies. 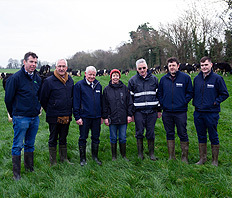 The major cross border dairy processing co-operative, Lakeland Dairies turned in an excellent business performance in 2018 with record revenues and profitability. Lakeland Dairies is a farmer owned dairy processing co-operative with a heritage of excellence spanning over 100 years. We process up to 1 Billion litres of farm produced milk into a wide range of dairy foodservice products and dairy food ingredients which we export to over 70 countries across the globe. We identify and meet the needs of our customers, competitively and cost efficiently, with wholesome, natural produce of the highest possible quality. With annual revenues of over half a billion euro, Lakeland Dairies employs 700 highly dedicated people across our operations. Our workforce are entrepreneurial, skilled and constantly striving for excellence. To read more about career opportunities within Lakeland Dairies, please click here. Read more About Us or explore our Company History.